If you thought this winter season was exceptionally brutal, it actually wasn’t. Looking back on past winter data, it turns out Chicago's winter season overall was actually warmer than normal. Despite a polar blast that brought near-record temperatures, the likes of which the city hasn’t seen in decades, the average temperature for December through February was warmer than a typical Chicago winter. According to data from the National Weather Service, the average high temperature for the 2018-19 season was 33.7 degrees. That’s 0.1 degrees above the 1981 to 2010 average. The average low temperature was 19.7 degrees, which was 0.6 degrees above normal. Overall, the mean temperature for the season was 26.7 degrees, also 0.3 degrees above normal, the data showed. When looking at precipitation, however, there’s a different story. A total of 8.09 inches of precipitation was recorded over the last few months, which is 2.32 inches above normal. There was also a total of 28.6 inches of snow recorded in Chicago. That number is 0.5 inches above normal. Still, several cold and snowy records were broken in the city this season, mostly in January. On Jan. 28, the city set a record for daily snowfall with 5 inches of snow. 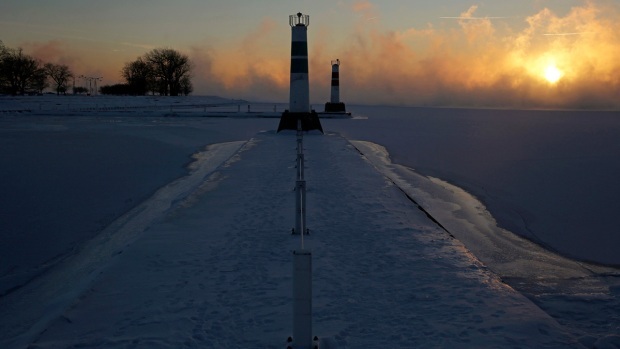 Just two days later, the area saw a record-low minimum temperature for Jan. 30, with -23 degrees. On the same day, the city also recorded the lowest maximum temperature of -10 degrees. By Jan. 31, a daily record low temperature of -21 was reported. The day also tied a record for the lowest daily maximum temperature, which was 1 degree. In February, Chicago saw a record high low temperature, with a 39-degree low on Feb. 3.